I love cookbooks!!! But will only buy cookbooks that have beautiful picture and that present challenging out of the box recipes. In my collection I have many books from Stephane glacier, Thomas Keller, Gordon Ramsey, Alain Ducasse and Christophe Michalak.. fun, fun, fun. Yesterday in search of an inspiration for our dinner, or for a dessert I lingered over the book that she gave me. 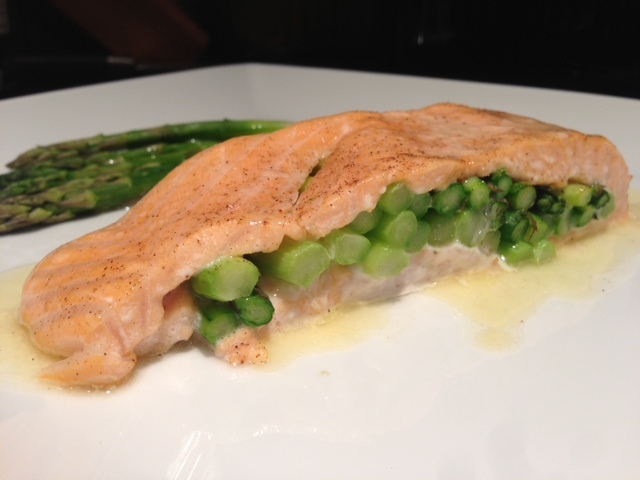 There were so many recipes I would have loved to make but settled on the salmon only because I had all the ingredients st home. 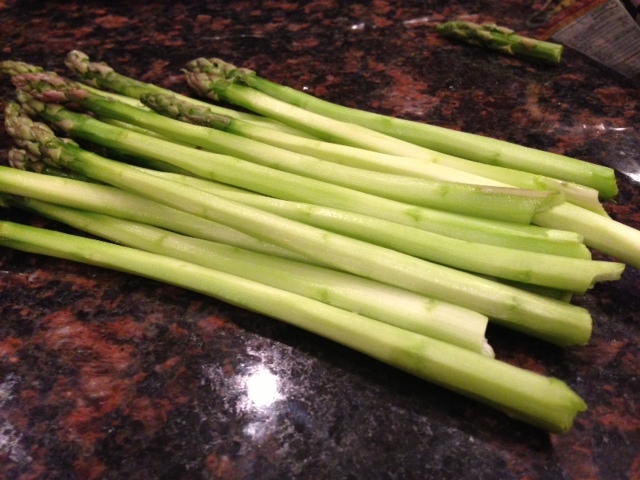 Trim the asparagus by breaking the ends. With a potato peeler, peel all the asparagus. 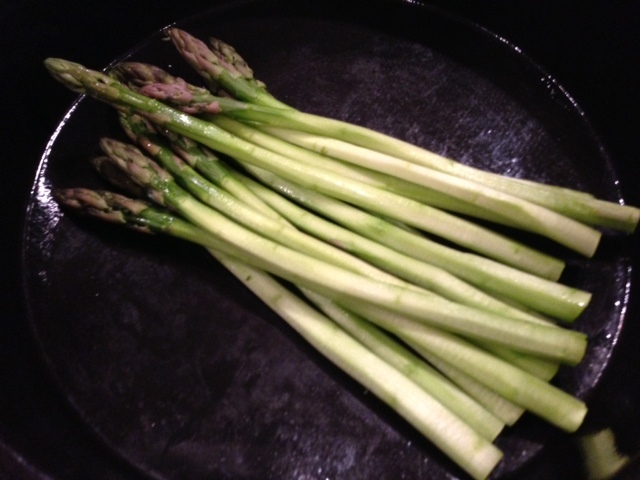 Place the asparagus in the large round mold, cover the octogonal silpat and microwave them for 2 minutes. 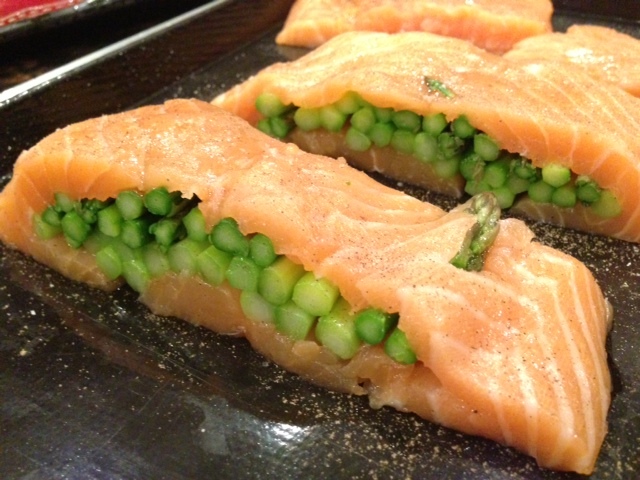 Meanwhile, slice the salmon filet in half in its thickness without cutting the edges of the salmon. 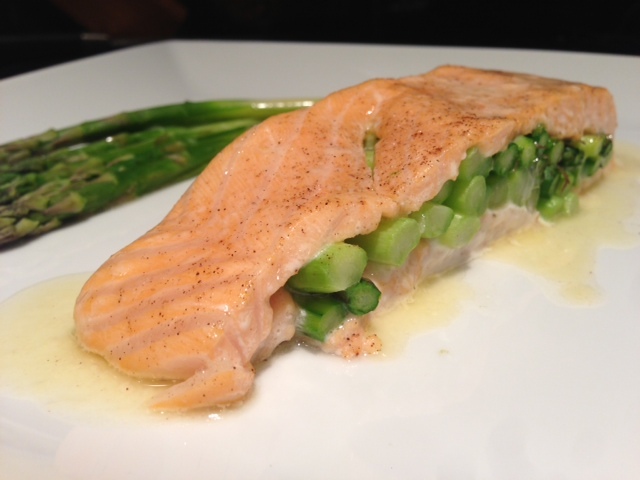 Place the asparagus inside the salmon as shown below. Trim the asparagus ends so that the asparagus flush with the salmon. 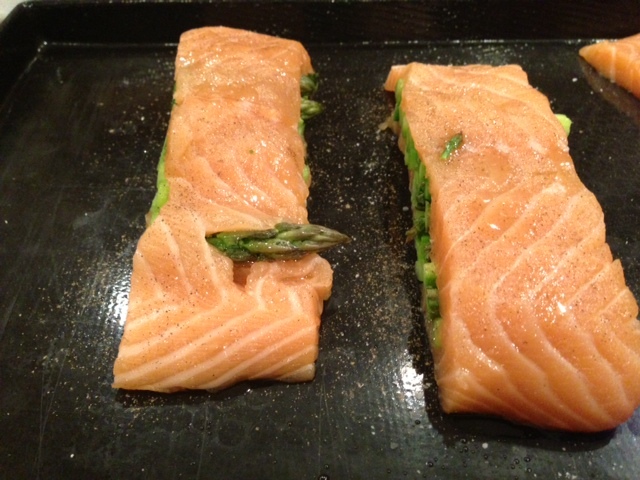 Cut the salmon in 2 or 4 equal portions. Place those stuffed filets on the flexipan. Drizzle oil with the oil spritzer, spritz some olive oil. Season with des salt and pepper and cook in s warm over for 5 minutes. 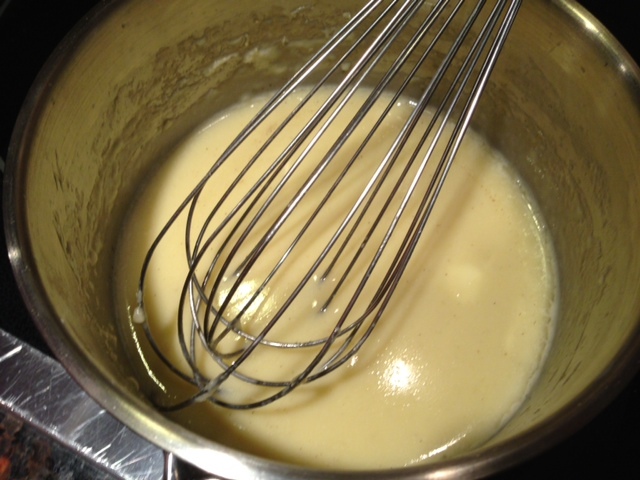 Meanwhile, prepare the lemon beurre blanc: in a small saucepan, warm up the white wine, the lemon juice and the cream and bring the mixture to boil. 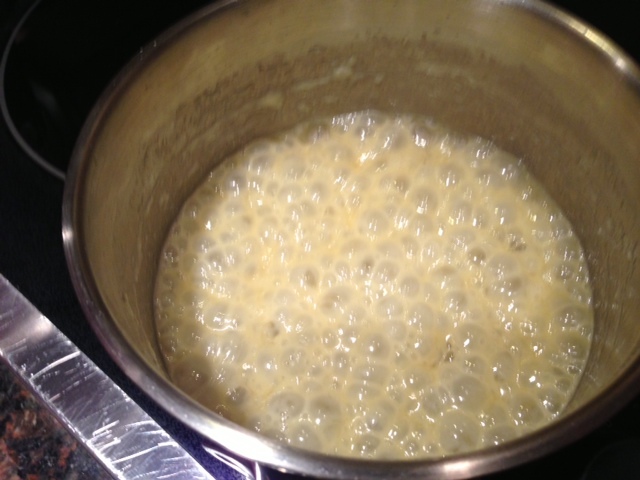 Cook the mixture until it reduces to about 2 tablespoons. Add the butter and whip it in. Season with salt and pepper. Add a dash of sugar if you think that the lemon beurre blanc is too sour. 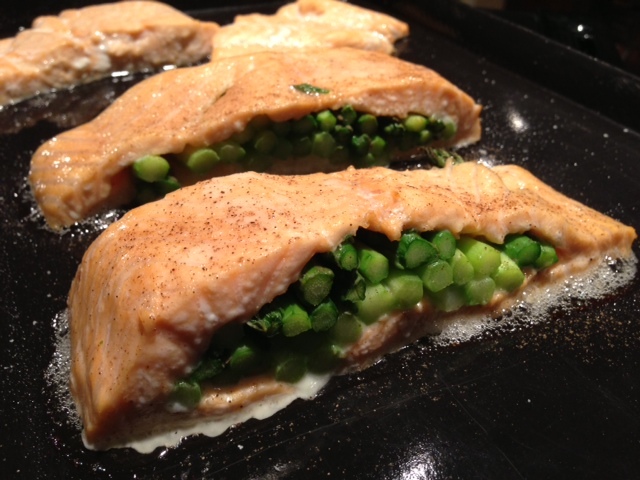 Place the salmon on individual plates and drizzle the sauce over the fish and eat up. Miam, Miam!! !